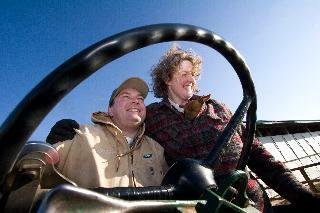 Hinchley's Dairy Farm is a family owned and operated Wisconsin Dairy Farm. We provide educational farm tours that are guided throughout a REAL, WORKING dairy farm. 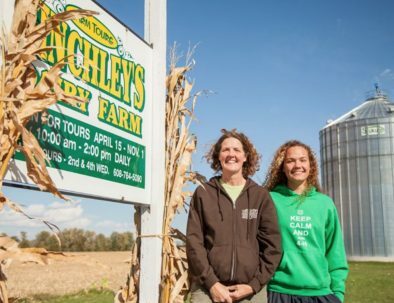 Hinchley's Dairy Farm is clean, safe, & the tour is hands on and family friendly. Come and see what farming is all about! Every day at Hinchley's is new and exciting, often there are a variety of babies from chicks to newborn calves for you to observe and enjoy. Everyone wants to milk a COW! While on a farm tour plan on hand milking a cow, petting and feeding many farm animals and an antique driven hayride* to the fields to see corn, soybeans, wheat and alfalfa. Learn what happens to these crops and how they are involved in your life! The Farm Tours spotlight the Holstein cows, but there are so many other farm animals to see and learn about too. While visiting the farm animals in the barnyard, you will learn about each type of species and also, food production, the progress of farming over time, and farm life. Farm theme birthday party includes a private dairy farm tour, hayride, and use of farm shed. Birthday carry-ins allowed. 50-200 people company picnics, or family parties on the farm. Visit the animals and use the farm shed. We take some animals on the road for picnics, parties, and schools. Traveling with animals has a minimum of $300. Have you milked a cow today? Did you visit a barnyard of farm animals lately? Would you like to have a Dairy Good Day at Hinchley's? Went here for a Birthday and the person that showed us around was incredibly patient with all the kids and making sure that no one was left out of any activity that they wanted to participate in. I walked away with greater knowledge about working dairy farms and what is in our food. Absolutely recommend this enlightening, energizing and informative tour with Tina. Thank you! What a fantastic learning experience! My 8 year old granddaughter said it was the best day ever! We learned so much! Tina was so informative and patient. It was well worth the two hour drive. Have you milked a cow today? Did you visit a barnyard of farm animals lately? Would you like to have a Dairy Good Day at Hinchley's? Book a tour today and come bottle feed young animals and enjoy harvest time on the farm. Hayrides free when weather permits. A antique tractor driven hayride to the farm fields. An amazing experience for the whole family!